The first step in determining rates is to narrow down the type of photography. Every type of photography service has a rate that corresponds with what is being offered with that service. This article will talk about three types of photography services that are most commonly offered. These would be portrait photography, event photography and commercial photography. You need to determine what is the “base rate” for your time. The base rate is the total of everything you pay or have to purchase in order to provide service to your clients. Write down all your equipment costs, service fees, supplies and travel costs. Decide how you want break down the depreciation on your equipment and spread that over the time you choose. Add up all these annual costs and divide them over 12 months. Determine your average number of shooting hours over a 30 day period. Divide the first number of monthly costs by the number of shooting hours for the month. This will give you the amount you need to include in your hourly shooting rate. This amount is the base you need to recover. Another factor common to most photographers is competition. It is a good idea to call around to other photographers in your area that are shooting the same types of work and get their prices. If you can, take a look at their work and their types of clients. This will give you an idea of what the local region supports for your type of photography service. Portrait photographers shooting in New York City will typically make more per hour than a portrait photographer in Des Moines, Iowa. 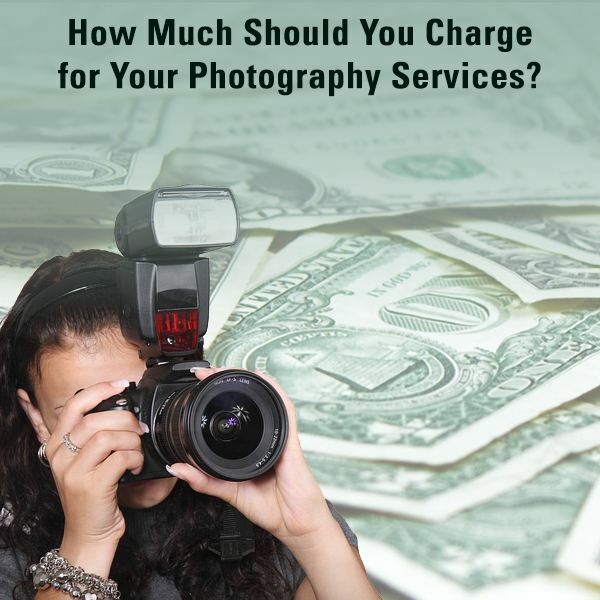 Now that you have your base rate and what local photographers are already charging, you can determine a standard rate based on the type of photography service. The studio rent, utilities and staff would be factored in with the original base rate. Your base rate is the amount you need to make (per average shooting hour) to break even. The only variable would be the cost of assistants for larger groups. In my area, portrait sitting fees range from $75.00 to $150.00. This number is influenced by the number of people in the shot. The number of breakaways, clothing changes and scene changes. Over all $100.00 per sitting fee is the average. To be competitive, I stay in the middle range. I figured my costs and know that I can make a profit over my break-even amount. The prints are priced out pretty much the same way. I add up my pigment costs, paper costs and add a 25% markup to cover imaging fees. I do not charge extra for imaging on portraits. Some photographers have a separate fee for retouching. To charge by per print or print packages, you will need to figure all your costs and determine the markup you want to add. Then, figure the cost of the various print sizes. This will be the total price. Some clients prefer a print package cost. That way they know what they are getting and they do not have to make the choices after the shoot. These two types of photography are together because they share similar costs. Many photographers charge their hourly rate for travel. My local area competition charges half of their hourly rate for travel. All fees are charged, bridge tolls, parking and any other incidentals to getting to the shoot. Photography day rates vary according to the area and the expertise and reputation of the photographer. A good mid-range day rate would be from $1,000.00 to $1,500.00 for the day. This rate is for shooting time only. Images are priced according to usage. If you are not sure about this, check out the ASMP Website for more information on usage. Proofing and editing are separate charges usually based on a standard digital imaging per hour charge. In my area, many imagers charge a mid-range price of $65.00 per hour. You can check around and also look at local graphic artists’ rates. Many commercial photographers charge a day (or half day) rate that includes a specific number of edited images. Event photographers may charge work for hire rates for the entire event. In this case, the only charge is for the total hours worked, travel and incidentals. All the images are burned or uploaded to the Web and given to the client. Keep in mind your break-even hourly cost. Check the competition to see what they are charging for an equal skill level and what the area supports. Find a profit margin that is in the range of what you want to make and is commensurate with your skill level and experience. Figure package prices based on all your costs and desired markups. Know the rights your client wants to buy. Periodically provide sales and introductory pricing to entice new customers and reward loyal clientele. If you have fair prices and produce quality work, you will have happy clients.